The Little Monster desk lamp in Leopard, will charm all ages. It’s perfect for a kid’s room, the dorm, or it can be a fun addition to any workspace. This LED light is great for homework and reading, or for the nightstand. 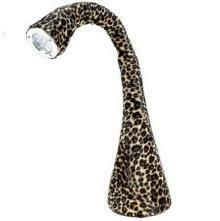 It features a bendable neck, which can twist and turn in all directions to position the light right where you need it. The LED light even changes colors for groovy mood lighting. Switch the Little Monster on and off or change colors with a simple squeeze of the head. USB adapter allows you to power this desk lamp from your computer. Leopard print fabric outer. Plastic construction. Includes white/color LED array. Takes 4 AA batteries (not included). Can be powered by included USB adapter. 24″ high. 5″ wide base.